I used to think the only way to get ultimate subwoofer bass was to spend thousands of dollars on a prestigious brand of subwoofer. 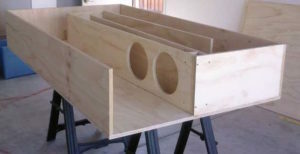 I thought that people who build their own subwoofers were fringe enthusiasts who cared more about building something than about sound quality. It turns out I was completely wrong. The opposite is true: DIY subwoofers can deliver sonic performance that’s impossible for commercial subs to replicate. 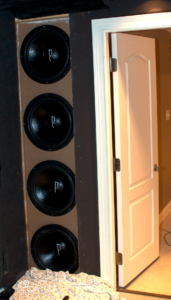 Here’s an overview of the two of the most effective subwoofers you can build yourself. Most commercial subwoofers are focused on achieving the best possible performance from the smallest cabinet size possible. Small cabinet size is a critical constraint. In general, people don’t want giant subwoofers in their living room and retailers don’t want giant boxes in their inventory. But to get to the ultimate level of subwoofer performance, the enclosure needs to be bigger. 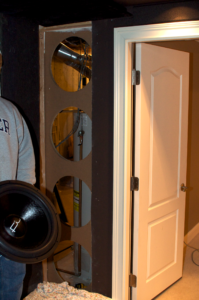 If you’re willing to invest your time to constructing a subwoofer enclosure, and are willing to devote the space in your home theater, a DIY subwoofer can give the ultimate performance. Infinite Baffle and Folded Tapped Horn are two of the best options that no conventional small enclosure can match. Infinite Baffle (IB) subwoofers use an enclosure that is nearly infinite in size. This is accomplished, not by building a really large enclosure, but rather by using an adjacent room as the enclosure. This “virtual enclosure” can be an equipment room, walk-in closet, crawlspace (below the floor), or attic space (above the ceiling). The only requirement is that the two spaces be separated from one another with no direct free airflow. Conventional sealed box subwoofers use the trapped air space inside the box to control speaker cone movement. They use a tremendous amount of power overcoming the pressure created inside the enclosure when moving the speaker cone. The lowest possible frequency is typically between 18 Hz and 25 Hz. Infinite Baffle subwoofers don’t have these constraints. The enclosure behind the woofer is so large that the woofer moves very freely, allowing frequencies down to 5 Hz. This may not seem significantly lower, but it’s actually 1.5 octaves worth of sound. In addition, IB subwoofers can achieve perfectly flat bass response, which is impossible with most other subwoofer designs. The low frequency threshold of human hearing is about 20 Hz. So you may wonder why you’d want a subwoofer that produces frequencies you can’t hear. The reason is simple: these are the frequencies that you can feel. In your chest. In your seat. Even in the hairs vibrating on your head. The other reason you want ultra low frequency subwoofer performance is because movie soundtracks contain these Ultra low Frequencies. You’re missing part of the movie experience otherwise. As with all designs, there are trade-offs. For Infinite Baffle, the first constraint is cone travel. Because there is no small trapped air space in the enclosure, the cone moves very freely and it’s easy to max out woofer travel at even low Sound Pressure Levels. The way to overcome this is to add more and/or bigger woofers. Infinite baffle designs typically use at least two 15-inch woofers, but can use four or more 18-inch woofers. The second drawback to Infinite Baffle subwoofers is low efficiency. For whatever sound is produced in the intended listening room, the exact same level of sound is also being created (and wasted) in the infinite baffle space of the second room. This means that extremely powerful amplifiers are required. 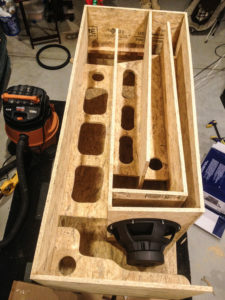 I posted more details about building an Infinite Baffle Subwoofer in my related article: How to Build the Ultimate Home Theater Subwoofer. You can also reference Eric’s IB Subwoofer page. Horn speakers (a.k.a. Compression Drivers) yield extreme Sound Pressure Levels by directing the output of the speaker into an “horn” that gradually expands in size. Basically, the efficiency comes form the megaphone effect. This speaker design is very common for tweeters and midrange drivers from companies such as Klipsch, but is extremely uncommon for subwoofers. This is because lower frequencies have substantially longer wavelengths that require substantially longer horns. The efficiency of a compression driver horn is based on two design parameters: the length of the horn and the rate at which horn diameter expands. A simple horn subwoofer has a straight horn that gradually expands. The size makes it unpractical for home theater (see photo.) A folded horn subwoofer wraps around itself to reduce size (similar to a tuba.) A folded tapped horn subwoofer has the back of the subwoofer placed near the horn exit, so the backwards motion of the woofer produces sound that reinforces sound produced by the forward motion through the horn. The reason folded tapped horns are so efficient is because they combine the “megaphone effect” of the horn with the “rearward subwoofer travel sound utilization effect” of the back of the speaker at the exit port. For a full horn subwoofer to reach 20 Hz, the horn length has to be 30 feet. However, most of the efficiency benefits can be realized by using half-length (15 feet) or quarter-length (7.5 feet) horn. A quarter-length horn can be folded into an enclosure that is approximately 4 feet x 6 feet x 1.5 feet in size. This enclosure size is small enough that it can be integrated into a home theater room, such as a riser under the second row of seating. A tapped horn subwoofer is so efficient that it can produce a Sound Pressure Level of 110 dB from only 1 watt of power. A conventional subwoofer design requires hundreds of watts to achieve this Sound Pressure Level. As with all subwoofers, the woofer must be optimized for the enclosure in which it is installed. Software such as HornResp can be used to model the enclosure performance. The Wolfhorn SDX thread on AVSforum is especially informative. Drawback of the Tapped Horn Subwoofer is the same as with all horns: the frequency response is not linear. Some frequencies are greatly exaggerated and a few frequencies are completely muted. 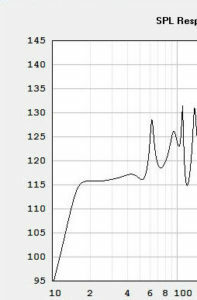 Luckily, there is only 1 or 2 frequency voids in the subwoofer frequency range (below 100 Hz) and this can be mitigated through equalization. The most cost effective method of amplifying your do-it-yourself subwoofer is a professional PA amplifier. They deliver huge amounts of power at relatively low costs. There downsides to these amps, such as louder fans, brighter lights, no IR remote input to turn it on or off, balanced XLR input connections (instead of conventional RCA connectors), and odd Speakon speaker cable connectors. 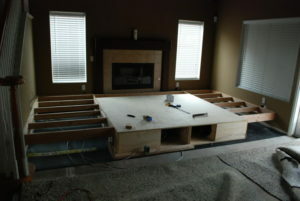 All of these issues can be overcome ,as detailed in my Infinite Baffle subwoofer install post. The amp that I use and recommend for Infinite Baffle subs is the Behringer EP4000. It’s a conventional Class A/B amplifier that is powerful and dependable. It costs about $300 and produces about 3000 Watts RMS of output. It doesn’t have a low frequency filter, so it will produce output all the way down to 5Hz and probably lower. Con: You have to use your own external amplifier to power the subs. Purchasing a ready-made subwoofer is the fastest and easiest way to get bass into your home theater. But if you are looking for the ultimate in performance, and are willing to invest time in design and construction, you can have incredible bass at a lower total cost. I am planning to buy car sub-woofer within the reasonable price. My budget is $200. Is it possible to buy quality within price? I am little bit confuse about that. Because I don’t have well knowledge about that. Do you any recommendation or suggestion?